Figure 5. Comparison between the possum Gymnobelideus (A) and the primate Phaner (B). Photograph (A) by A. Smith; photograph (B) by R. Mittermeier reproduced with his permission. nal, and is an agile arborealist, capable of making leaps of a meter or more in distance. 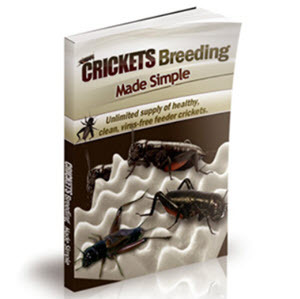 The diet is very similar to those of cheirogaleids, consisting of insects, tree exudates, flower products, and even secretions of homopteran insects, as also observed in Phaner and Mirza (Hladik et al., 1980; Pages, 1980; Smith and Ganzhorn, 1996; Smith, 1984c, 1984d; Sussman, 1999; Wright and Martin, 1995). Gymnobelideus resembles the primates Callithrix, Cebuella, and Phaner in gouging or scraping tree trunks to generate the flow of exudates (Charles-Dominique and Petter, 1980). The arthropod prey of Gymnobelideus consists of tree crickets, beetles, moths, and spiders (Lee and Cockburn, 1985). In addition, these marsupials feed on manna (a carbohydrate exudate from eucaplypt leaves). Among phalangeroids, Gymnobelideus is one of the best overall matches ecomorphologically to the primitive primate Mirza, the exudate specialist Phaner, and the primate-like didelphid Caluromys. The other nongliding genus in Petauridae is Dactylopsila, which has already gained fame in comparison to primates by sharing a specialized feeding adaptation with the Malagasy aye-aye, Daubentonia (Cartmill, 1974b; Rand, 1937). Both taxa have enlarged incisors for gouging wood, which they utilize to open the tunnels of wood-boring larvae, and an elongated finger on the hand tipped with a hooked nail, which they use to ream out beetle larvae. Both tap the wood with their forefeet, apparently using auditory clues to detect subsurface features (Erickson, 1995). The small-bodied Dactylopsila is even more similar in size and shape to the extinct apatemyids than it is to the much larger Daubentonia; apatemyids were a very successful group of arboreal Eocene mammals widespread in North America and Europe (Koenigswald, 1987). It has been pointed out that Madagascar, Australasia, and the Eocene all lack woodpeckers (Picidae), birds that specialize on wood-boring larvae on most landmasses today (Cartmill, 1974b; Koenigswald, 1987). Dactylopsila is reported to be a frenetic, extremely quick and active arborealist, quite a contrast to the more deliberate, heavy Daubentonia. In addition to its wood-boring activities, Dactylopsila breaks into the nests of eusocial insects (Smith, 1982b), and also feeds on crickets, spiders, and other arthropods (Lee and Cockburn, 1985). Dactylopsila shows greater orbital convergence than phalangerids proper (Cartmill, 1972). In the future, research should investigate the extent to which the adaptations of Dactylopsila match primate attributes aside from the aye-aye parallels. Figure 6. 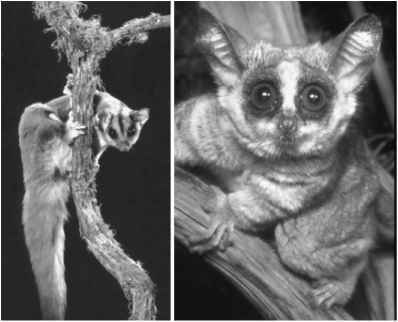 The possum Petaurus norfolcensis (A), one of the larger species of gliding petaurids, compared to Galago moholi (B), a small galagine. Photograph (A) by E. Beaton, www.estherbeaton.com; photograph (B) T. Rasmussen. communicate chemically using well-developed scent glands, and vocally by using a diversity of calls (Goldingay, 1992). P. breviceps nests gregariously in apparent kin groups of up to about seven individuals. Its life history is also similar to that of small-bodied prosimians, producing one litter per year of one or two offspring, which grow up fairly slowly. The young are independent at three months and disperse by about 10 months of age. Gymnobelideus, Dactylopsila, and Petaurus have the highest encephaliza-tion quotients of any marsupials, a final important parallelism with primates (Lee and Cockburn, 1985; Nelson and Stephan, 1982).